Hubble repair mission; five spacewalks. AKA: Discovery;HST-SM2. Launched: 1997-02-11. Returned: 1997-02-21. Number crew: 7 . Duration: 9.98 days. After the OMS 2 burn Discovery was in a 350 x 579 km x 28.5 deg orbit; later on February 11 perigee was raised to 480 km and on February 12 it was in a 576 x 584 km orbit. The Hubble Space Telescope was in a 589 x 598 km x 28.5 deg orbit. The Shuttle completed its rendezvous with Hubble on February 13. Steve Hawley used the RMS arm to grapple HST at 08:34 GMT and by shortly after 09:00 GMT the telescope was docked to the FSS (Flight Support Structure) in the aft part of the cargo bay. Over the next four days five spacewalks were undertaken to renovate Hubble. On February 14 astronauts Mark Lee and Steven Smith carried out spacewalk EVA-1 to install the STIS and NICMOS science instruments. The spacewalkers discovered potentially serious rips in Hubble's insulation, caused by degradation over the seven years the material has been in orbit. An orbital debris puncture in an antenna was also noticed. EVA-2, by Greg Harbaugh and Joe Tanner, replaced the Fine Guidance Sensor in a 7h 26m spacewalk. EVA-3, by Lee and Smith, made a 7h 11m walk to install a new computer and data recorder. EVA-4 was 6h 34m and saw installation of new electronics and covers on the magnetometer sensors, plus initial repairs to the insulation. EVA-5 involved more insulation repairs; the astronauts then spent some time in the airlock awaiting word on whether an extra gyro replacement would be needed, before finally cleaning up the payload bay and repressurizing after a 5h 17m walk. No sixth spacewalk was needed; a suspect Reaction Wheel Assembly has tested out and did not need to be replaced. PAYLOAD AND VEHICLE WEIGHTS: Orbiter (Discovery) empty and 3 SSME's: 82,952 kg; Shuttle System at SRB Ignition: 2,047,270 kg; Orbiter Weight at Landing with Cargo: 96,762 kg; Flight Support System: 2,033 kg; Orbital Replacement Unit Carrier: 3,165 kg; Second Axial Carrier: 2,392 kg; Hubble Space Telescope (while berthed to Discovery) 11,140 kg. February 11, 1997, 3:55:17 a.m. EST. Launch originally targeted for Feb. 13 moved up to Feb. 11 to provide more range opportunities. Countdown proceeded smoothly to on-time liftoff Feb. 11. First flight of Discovery after Orbiter Maintenance Down Period (OMDP). February 21, 1997, 3:32:26 a.m. EST, Runway 15, Kennedy Space Center, Fla. Rollout distance: 7,066 feet (2,154 meters) Rollout time: one minute, zero seconds. Mission duration: nine days, 23 hours, 37 minutes, nine seconds. Landed on revolution 150. Landed on second opportunity after first waved off due to low clouds. Ninth night landing in Shuttle program history and fourth at KSC. STS-82 demonstrated anew the capability of the Space Shuttle to service orbiting spacecraft as well as the benefits of human spaceflight. 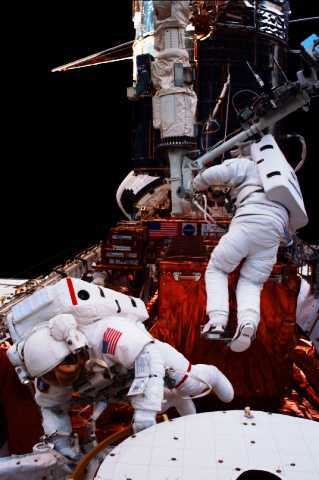 Six-member crew completed servicing and upgrading of the Hubble Space Telescope during four planned extravehicular activities (EVAs) and then performed a fifth unscheduled spacewalk to repair insulation on the telescope. HST deployed in April 1990 during STS-31. It was designed to undergo periodic servicing and upgrading over its 15-year life span, with first servicing performed during STS-61 in December 1993. 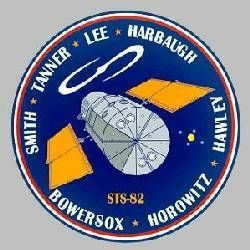 Hawley, who originally deployed the telescope, operated the orbiter Remote Manipulator System arm on STS-82 to retrieve HST for second servicing at 3:34 a.m. EST, Feb. 13, and positioned it in payload bay less than half an hour later. Relying on more than 150 tools and crew aids, Lee and Smith performed EVAs 1, 3 and 5, and Harbaugh and Tanner did EVAs 2 and 4. EVA 1 began at 11:34 p.m. EST, Feb. 13, and lasted six hours, 42 minutes. One of Hubble's solar arrays was unexpectedly disturbed by gust of air from Discovery's airlock when it was depressurized, but was not damaged. Lee and Smith removed two scientific instruments from Hubble, the Goddard High Resolution Spectrograph (GHRS) and Faint Object Spectrograph (FOS), and replaced them with the Space Telescope Imaging Spectrograph (STIS) and Near Infrared Camera and Multi-Object Spectrometer (NICMOS), respectively. STIS will provide two-dimensional spectroscopy, allowing the instrument to gather 30 times more spectral data and 500 times more spatial data than existing spectrographs on Hubble, which look at one place at a time. EVA 2 began at 10:25 p.m., Feb. 14, and lasted seven hours, 27 minutes. Harbaugh and Tanner replaced a degraded Fine Guidance Sensor and a failed Engineering and Science Tape Recorder with new spares. Also installed a new unit called the Optical Control Electronics Enhancement Kit, which will further increase the capability of the Fine Guidance Sensor. During this EVA astronauts noted cracking and wear on thermal insulation on side of telescope facing sun and in the direction of travel. EVA 3 began at 9:53 p.m., Feb. 15, and lasted seven hours, 11 minutes. Lee and Smith removed and replaced a Data Interface Unit on Hubble, as well as an old reel-to-reel- style Engineering and Science Tape Recorder with a new digital Solid State Recorder (SSR) that will allow simultaneous recording and playback of data. Also changed out one of four Reaction Wheel Assembly units that use spin momentum to move telescope toward a target and maintain it in a stable position. After this EVA, mission managers decided to add EVA 5 to repair the thermal insulation on HST. EVA 4 began at 10:45 p.m., Feb. 16, and lasted six hours, 34 minutes. Harbaugh and Tanner replaced a Solar Array Drive Electronics package which controls the positioning of Hubble's solar arrays. Also replaced covers over Hubble's magnetometers and placed thermal blankets of multi-layer material over two areas of degraded insulation around the light shield portion of the telescope just below the top of the observatory. Meanwhile, inside Discovery Horowitz and Lee worked on the middeck to fabricate new insulation blankets for HST. Final spacewalk, EVA 5, lasted five hours, 17 minutes. Lee and Smith attached several thermal insulation blankets to three equipment compartments at the top of the Support Systems Module section of the telescope which contain key data processing, electronics and scientific instrument telemetry packages. STS-82 EVA total of 33 hours, 11 minutes is about two hours shy of total EVA time recorded on first servicing mission. Discovery's maneuvering jets fired several times during mission to reboost telescope's orbit by eight nautical miles. Hubble redeployed on Feb. 19 at 1:41 a.m. and is now operating at the highest altitude it has ever flown, a 335- by 321-nautical-mile orbit. Initial checkout of new instruments and equipment during mission showed all were performing nominally. Calibration of two new science instruments was to take place over a period of several weeks with first images and data anticipated in about eight to 10 weeks. Two more servicing missions planned for 1999 and 2002. Performance of Discovery was nominal throughout the mission. Family: Manned spaceflight. People: Bowersox, Harbaugh, Hawley, Horowitz, Lee, Smith, Steven, Tanner. Country: USA. Spacecraft: Discovery. Projects: STS. Launch Sites: Cape Canaveral. Agency: NASA, NASA Houston. 1997 February 12 - . STS-82 - Wakeup Song: Magic Carpet Ride - . Flight: STS-82. "Magic Carpet Ride" by Steppenwolf CAPCOM: Chris Hadfield. 1997 February 13 - . STS-82 - Wakeup Song: These Are Days - . Flight: STS-82. "These Are Days" by 10,000 Maniacs CAPCOM: Chris Hadfield. 1997 February 14 - . STS-82 - Wakeup Song: Two Princes - . Flight: STS-82. "Two Princes" by Spin Doctors CAPCOM: Chris Hadfield. 1997 February 15 - . STS-82 - Wakeup Song: Higher Love - . Flight: STS-82. "Higher Love" by Steve Winwood CAPCOM: Chris Hadfield. 1997 February 16 - . STS-82 - Wakeup Song: The Packerena - . Flight: STS-82. "The Packerena" For Mark Lee CAPCOM: Chris Hadfield. 1997 February 17 - . STS-82 - Wakeup Song: Shiny Happy People - . Flight: STS-82. "Shiny Happy People" by R.E.M. CAPCOM: Chris Hadfield. 1997 February 18 - . STS-82 - Wakeup Song: Dreams - . Flight: STS-82. "Dreams" by The Cranberries CAPCOM: Chris Hadfield. 1997 February 19 - . STS-82 - Wakeup Song: That Thing You Do! - . Flight: STS-82. "That Thing You Do!" Theme from the motion picture CAPCOM: Chris Hadfield. 1997 February 20 - . STS-82 - Wakeup Song: Five Hundred Miles Away From Home - . Flight: STS-82. "Five Hundred Miles Away From Home" by Reba McEntire CAPCOM: Chris Hadfield. STS-82 - Wakeup Song: Sloop John B - . Flight: STS-82. "Sloop John B" by The Beach Boys (down linked by crew)"Born to Be Wild" by Steppenwolf CAPCOM: Chris Hadfield.